In the mid-1920’s the songsmiths of Tin Pan Alley were crooning “Doodle-Doo-Doo”, and about “Swanee” and “Sweethearts”. It was the era of that great hit “Looking at the World Thru Rose Colored Glasses” and of songs whose lyrics rhymed with such new words as Frigidaire. Yes siree! the songs of the day were right up with the times, and the times were a changin’! With the introduction of the electric or gas fridge the shape of North American kitchens, and indeed the lives of millions of folk, changed forever. And progress was the byword of the 1920’s. While the ice box had been around for a couple of decades, the brand-spanking-new fridges were a tremendous step forward. Convenience was a huge selling point. No longer did one have to add ice daily and carry out the drip trays that were ever filling up with the melt-off. Storage capacity increased dramatically, thus saving the need for frequent trips to the market. And indeed, with the birth of the television around the corner, shortly there-after emerged that culinary break-through -- the TV dinner! Two of the most popular brands of refrigerators were Frigidaire (produced by a subsidiary of General Motors) and Kelvinator. Another noteworthy model was made by General Electric, -- their “Monitor-Top” refrigerator, introduced in 1927. This first GE fridge with its exposed refrigeration unit was produced until 1936. The condenser coils that wound around the steel case of the cooling unit garnered it the nickname of the “bird cage”. It was generally ridiculed by the competition. With the revolution of the refrigerator came many wonderful new items including a large assortment of fridge jars and containers. These were important since the cubic footage of these heavily encased units was quite limited when compared to today’s mechanical marvels. The variety of glass kitchen items was incredibly alluring for the housewives of the 1920’s through to the 1940’s. New and improved glass items were dreamt up by household science experts from every major company - batter bowls, decanters, egg cups, oil and vinegar cruets, knives, water dispensers, ice buckets, ladles, mugs, napkin holders, rolling pins, salt boxes, sundae glasses, syrup pitchers, and even water bottles. There were, however, a certain set number of more or less basic items that were produced by all the major kitchen ware manufacturers. 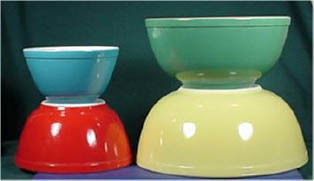 Mixing bowls were one of the basic items. 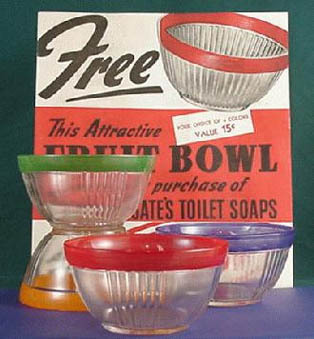 The bowls usually came in sets of three or four sizes. They were called “nesting sets” since each of the bowls neatly fitted inside one-another. In tandem with the nesting bowl sets was also often found a grease jar. This was usually no more than a smallish sized bowl with a lid. A few companies created grease or drippings jars by simply labeling their small fridge containers, such as a 4x5 inch size, “DRIPPINGS”. Shakers, of approximately 10 oz capacity, went beyond the salt and pepper dispensers that we are accustomed to in our present-day kitchens. Most shaker sets were also composed of two additions -- a sugar shaker and a flour shaker. Often, matching these shakers were larger canisters of approximately 40 ounces. They were labeled for sugar, tea, coffee and cereal. Fridge containers were most often square or rectangular in shape with sizes of approximately 4 x4, 4 x 8, or 8x8 inches. 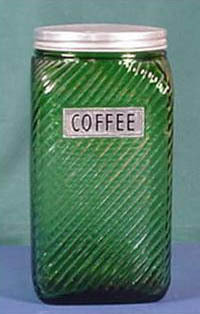 A few canisters were also made in an oval shape, most notably by Hocking Glass company in transparent green glass. Butter dishes were designed with entire blocks of butter in mind. Therefore, there was the standard one pound size, and the less often found quarter pound size. Measuring cups, like the mixing bowls, were produced in nesting sets of four dimensions - 1 cup, 1/2 cup, 1/3 cup and 1/4 cup, each having a tab handle. Most manufacturers of glassware during the 20’s and 30’s jumped on the lucrative bandwagon of producing these kitchen goods. A handful of companies do, however, stand out due to the large scope and quantity of their products. Three firms were head-and-shoulders above the others when it came to innovation in manufacture of glass kitchen items -- the McKee Glass Company, the Jeannette Glass Company, and the Hocking Glass Company. The oldest of these, the McKee Glass Company, was a particularly big player in the kitchen glass corner. This well-established company had been around since 1853. In the beginning it was renowned for its pressed glass tableware. In 1888, the company relocated from Pittsburgh to a small town in Pennsylvania. The town was renamed Jeannette for the wife of the McKee company’s founder. [Hey gentlemen!! Need to get in the wife’s good books? ...Just name a town after her!!] By 1931 the McKee Company had produced items in an opaque light green glass, that they called “Skokie”, as well as other opaque shades including light blue - “Chalaine blue”, yellow -- called “Seville”, custard, white, and black. Having been hit hard by the depression, it was the popularity of these opaque glass items that put the McKee Glass Company back on its feet. By 1926, Jeannette was advertising many kitchen items in its clear green color that they themselves described as “somewhat like a brilliant apple green but different.” In 1932, they introduced kitchen items in an opaque light green shade, similar to McKee’s “Skokie”, that they called “Jadite”. Thousands of people who have seen Martha Stewart’s kitchen have been made aware of this quite attractive shade in kitchen items. In 1932, they produced, in a somewhat lesser amount, an opaque light blue dubbed “Delfite”. They also turned out what they called Jenny ware, a ribbed line of kitchen items in clear pink, crystal, and ultramarine (a most unusual color for this era) in 1937. The range of these wares included butter dishes, measuring cups, salt and pepper shakers, mixing bowls, tumblers, pitchers and of course reamers. Like the Jeannette Company, the Hocking Glass Company also began production early in the century. Hocking opened its doors in 1905, in Lancaster Ohio, primarily making small hand made articles. By the 1920’s they produced, quite a range of items --”tableware, plain and decorated; tumblers, jellies, lamp chimneys and lantern globes, opal ware, specialties and novelties”. 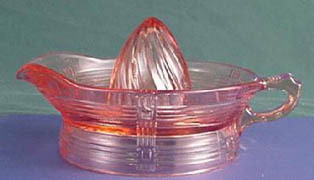 Hocking was noted for its use of color in its glass production. Amber, green, blue, canary (yellow), flamingo (pink) and an opaque white called “Vitrock” show the diversity of the Hocking color palette. In 1937 Hocking merged with the Anchor Cap and Closure Corporation of New York and became one of the biggest players on the American glass scene, manufacturing both tableware and containers. Other major players were the immense conglomerate known as the U.S. Glass Company, and the Owen-Illinois Glass Company which was somewhat better known for its bottle production. It seems that so many types of collectibles are only feasibly displayed behind glass windows of display cases or in folios filled with special protective pages. One of the especially nice things about collecting kitchen ware is that they are so very usable -- utilitarian. Of course, one might wander into one’s front parlour on special occasions to lounge on the settee or perch on the side chairs to admire some treasures, or perhaps take the Model “T” out for a weekend spin to a antique car rally, but with kitchen items it is a very different story. We live in our kitchens. Let’s consider that the average person uses the kitchen for at least two or three meals per day every day of the year. Also consider that the call of the ice box beckons scores of us mere mortals to peer into its depths yet another once or twice or thrice a day. We live in our kitchens. A modest collection of kitchen wares can be comfortably housed in one’s most important room -- the kitchen. Whatever your preference in color you are bound to find a wide selection of Depression Glass kitchen wares exactly to your tastes. AMBER: transparent coloring only, much of this produced by the Federal Glass Company. CHALAINE BLUE: Opaque light blue, “robin’s egg” blue, a scarce color. COBALT BLUE: Dark, rich transparent blue, mostly produced by Hazel Atlas Glass Company. BLACK: an opaque color, McKee, Fenton, and L.E. Smith were the main producers. CRISS CROSS: Hazel-Atlas Glass Company’s kitchen pattern featuring intersecting bands of four lines, 1936-1938. Bowls, shakers, measuring cups, fridge jars, butter dish, pitcher, tumbler, and reamers produced in crystal, green, and pink. DELPHITE: Another opaque blue, darker than Chalaine, produced by Jeannette and McKee Glass Companies. DOTS: Hazel Atlas, Hocking, and McKee Glass Companies produced glass with black, blue, green, red, or yellow dots on custard or white opaque glass. 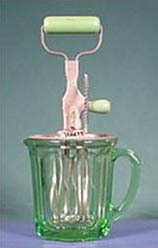 Pitchers, bowls, fridge jars, shakers, butter dishes, canisters, and drip jars were manufactured. CLAMBROTH GREEN: A translucent, light green shade. CLAMBROTH WHITE: A translucent, milky white color. CRYSTAL: The depression glass collector’s name for clear glass. CUSTARD: Opaque glass in a light beige shade. JADITE: An opaque green shade, ranging from light to dark green. JENNY WARE: Jeannette Glass Company’s kitchen pattern with a ribbed design, 1936-1938. Bowls, water bottle, butter dishes, creamer, pitcher, reamers, refrigerator jars, sugar, and tumblers found in pink, crystal, and ultramarine. FOREST GREEN: A transparent dark green. GREEN: Transparent, produced by most depression glass companies. PINK: Transparent, another widely produced shade. RED: Transparent, few items produced. SEVILLE: McKee’s opaque yellow shade. SHIPS: McKee Glass Company’s nautically patterned kitchen glass. Red ship, anchor and wheel on opaque white glass. Items include bowls, butter dish, drippings jar, egg cups, fridge jars, canisters, and shakers. SKOKIE: McKee Glass Company’s opaque, light jade green color. VITROCK: Hocking’s opaque, pristine white glass. WHITE: Opaque white, like milk glass, McKee Glass Company and others. YELLOW: Transparent color, few items manufactured.